Tulsa Race Riot miniseries to come to OWN. 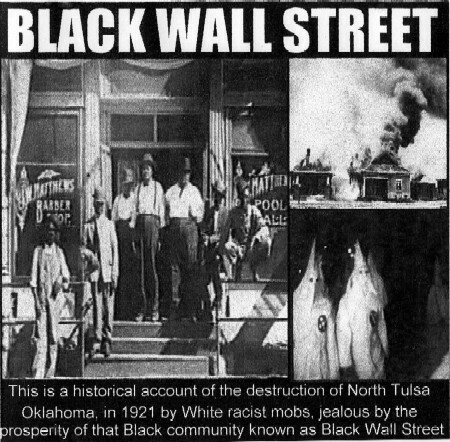 In 1929, race riots tore down the little-known area of America once known as “Black Wall Street,” where hundreds of middle-class and upwardly mobile African-Americans sheltered for their own version of the American dream. The community burned to the ground, and finally the unsung heroes of this era will have their say to national audiences through a two-part miniseries on Oprah Winfrey’s OWN network. Octavia Spencer will play a journalist whose story sheds light on the stories of countless others in the new mini-series, executive produced by Nancy Miller with African-American screenwriter (my brilliant cousin!) Dayna L. North and others co-producing. Thank you Shahidah…it’s a long overdue story to be told!